2014 소치 올림픽: 불완전한 신체조건으로, 올림픽에서의 완벽을 추구한다. South Korea's figure-skating gold medalist Yuna Kim, is one of the biggest stars of the Games. At 5-foot-5, she is also one of the biggest skaters. 한국의 피겨 스케이팅 금메달리스트 김연아는 올림픽 최대의 스타 중 하나이다. 5피트 5인치 (약 165cm)의 키로, 그녀는 또한 가장 키가 큰 스케이터 중 하나이다. Sarah Hughes, also 5-5, was initially dismissed by some coaches as being too tall for her sport. Yet she became the 2002 Olympic champion in figure skating. 사라 휴즈 또한 5피트 5인치의 키를 갖고 있는데, 처음에는 이 종목을 하기에는 너무 키가 크다고 몇몇 코치들로부터 거절당했었다. 그러나 그녀는 2002년 올림픽에서 피겨 스케이팅 챔피언이 되었다. "What I did, and what I would advise any aspiring Olympian to do is to use whatever it is you have to your advantage," she said. 꿈을 품은 올림피언들에게 제가 조언하는 것이 자신이 무엇을 가졌건 그것을 장점으로 이용하라는 거예요." 그녀가 말했다. The idea that small is better is pervasive throughout figure skating for a reason. Like gymnastics, success in figure skating is largely built around a strength-to-weight ratio, and like smaller gymnasts, smaller figure skaters have an easier time twirling their bodies while airborne. A smaller top completes its revolutions so much faster than a larger one. 피겨 스케이팅계에서는 작을수록 좋다는 생각이 만연한 데에는 이유가 있다. 체조처럼 피겨 스케이팅에서의 성공은 주로 힘과 무게의 비율을 중심으로 만들어지며, 작은 체조선수처럼, 작은 피겨 스케이터일수록 공중에서 그들의 신체를 회전시키는 것이 수월하기 때문이다. 작은 팽이일수록 큰 것보다 훨씬 빠르게 회전을 할 수 있다. Adrian Bejan, an engineering professor at Duke University who studies sports evolution, worked out a formula showing that a skater who is 20% taller than her competitor, will spin 10% more slowly, a significant difference for skaters trying to complete three and four airborne revolutions and land on a blade about 3/16 of an inch thick. 듀크대에서 스포츠 진화를 연구하는 엔지니어링 교수 Adrian Bejan은 경쟁자들보다 20% 큰 스케이터가 10% 느리게 돈다는 공식을 도출해냈는데, 3, 4바퀴의 공중회전을 하고 3/16인치 두께의 블레이드 하나로 착지해야 하는 스케이터들에게 있어서는 커다란 차이가 된다. Gracie Gold, the current U.S. champion was still 5-foot tall in middle school. At 13, she grew 4 inches, and had one of her worst years in junior skating. "If you feel tall, it's not good," Gold said. "It's that much more body to throw up into the air in spin. It's good to feel small and quick." 현 US 챔피언이 그레이시 골드는 중학교 때에는 5피트(약 153cm)였다. 13살에 그녀는 4인치(약 10cm)가 자랐고 그녀는 주니어 시절 최악의 한 해를 보냈다. "키가 크다고 느끼면, 그건 좋은 게 아니에요." 골드가 말했다. "공중으로 회전하는데 던져야 할 몸이 더 많아진다는 거죠. 작고 빠르다 느끼는 것이 좋은 거예요." Other than Hughes and Kim, most recent female skating champions have been diminutive to say the least. Nancy Kerrigan, who looked so much taller than nearly everyone else, is just 5-foot-4. Michelle Kwan was 5-foot-2, Kristi Yamaguchi and Tara Lipinski who were 5-foot-1 and not surprisingly, natural jumpers. 휴즈와 김연아 외에 최근의 여자 스케이팅 챔피언들은 조금도 과장하지 않고 작다고 할 수 있다. 대부분의 다른 선수들보다 훨씬 크게 보였던 낸시 캐리건도, 겨우 5피트 4인치(약 162.5cm)였으며, 크리스티 야마구치와 타라 리핀스키는 5피트 1인치(약 155cm)였으며, 놀랄 것도 없이 그들은 타고난 점퍼들이었다. Yet Kim is widely recognized as an ethereal skater. Aesthetically, she is a vision of grace and athleticism on the ice, and her height—along with her leg strength, help get her there. Judges appreciate the commanding presence bestowed by a big, long-limbed body. There are skaters who are more flexible than Kim, and who spin faster and jump higher, but none complete every element with her combination of beauty and precision. 그렇지만 김연아는 천상의 스케이터로 인정받고 있다. 미학적으로 그녀는 빙판 위의 우아함과 기술능력의 화신이며, 그녀의 키와 다리의 힘이 함께 그녀가 그러한 지위에 있도록 돕고 있다. 심판들은 크고 긴 팔다리가 부여하는 위엄있는 존재감을 인정한다. 김연아보다 더 유연하거나 스핀을 더 빨리 돌거나, 높게 점프하는 스케이터가 있다 하더라도, 그녀처럼 아름다움과 정확성을 겸비하고 모든 요소를 수행해내는 사람은 없다. "She trains the fast twitch, quick firing of her muscles," said Michael Weiss, the former American national champion and NBC Olympic commentator. Think box-jumps, and running with quick steps through ladders on the floor. "She does a lot of plyometrics and off-ice fitness training so she can spring off the ice and spur the rotation." "그녀는 근육들을 재빠르게 긴축하는 훈련을 합니다." 전 미국 내셔널 챔피언이자 NBC 올림픽 해설자인 마이클 와이즈가 말했다. 박스점프(상자 같이 높이 있는 곳에 점프해서 오르내리는 훈련)와 바닥에 사다리를 놓고 빠른 스텝으로 뛰는 걸 생각해보라. "그녀는 많은 플라이오메트릭 트레이닝이나 오프 아이스 피트니스 훈련으로 빙판을 튀어오르고 회전의 박차를 가할 수 있는 것이죠." Don't be fooled by Kim's delicate shoulders and torso. Her lower-body, especially her thighs and hips are as powerful as a sprinter's. Lipinski says Kim has also made herself a technically perfect jumper, entering every jump perfectly vertical with her elbows, arms and legs held so tight to her body that "there is no air between anything." 김연아의 가녀린 어깨와 몸통에 속지 말라. 그녀의 하체, 특히 허벅지와 힙은 스프린터만큼 파워풀하다. 리핀스키는 김연아가 모든 점프를 할 때, 완벽하게 팔꿈치와 수직이 되고, 팔과 다리를 몸통에 붙여 "공기도 들어갈 틈도 없이" 매우 타이트하게 유지하는 것이 기술적으로 완벽한 점퍼로 만든다고 말한다. 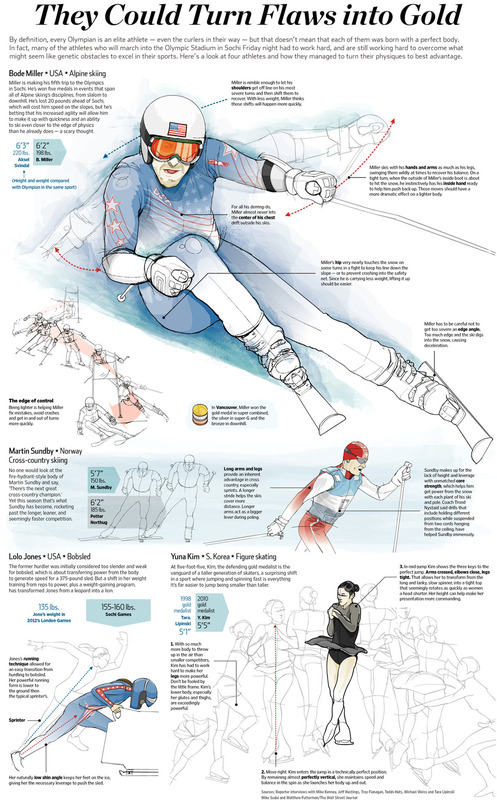 The head turned to the left and the prerotation of the feet in the line drawing are the direct opposite to the true attribute of Yuna's jumps, thus would allow WSJ's caption about Yuna's position being "perfectly vertical"(image #2) to fail to support its claim. Yuna, with no prerotation on her feet, and with her chin pulled in, maintains her head and neck straight and forward throughout the COMPLETE course of her jump. This attribute of her jumps that is rarely seen in the sport has given her the nickname of "textbook jumper" and makes her air position truly "perfectly vertical". 선그림에서 왼쪽으로 돌아간 목과 발의 프리로테는 김연아 선수의 점프를 특징짓는 요소들과 정반대되는 것으로, 사실상 김연아 선수의 점프 포지션을 "완벽하게 수직"인 것으로 설명한 WSJ의 2번 설명을 무력화시킵니다. 김연아 선수는 발에 프리로테가 없으며, 턱을 바짝 당긴채 점프코스의 처음부터 끝까지 얼굴을 돌리지 않습니다. 이것이 교과서점퍼라는 별명을 얻은 김연아 선수의 공중자세가 이 스포츠에서 매우 보기 드문 것으로, "완벽하게 수직"인 이유입니다.